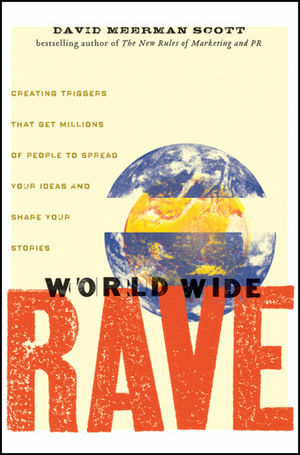 A World Wide Rave is when people around the world are talking about you, your company, and your products. It's when communities eagerly link to your stuff on the Web. It's when online buzz drives buyers to your virtual doorstep. It's when tons of fans visit your Web site and your blog because they genuinely want to be there. What happens when people can't stop talking online about you, your company, and your products? A World Wide Rave is born that can propel a brand or company to seemingly instant fame and fortune. How do you create one? By learning the secret to getting links, YouTube, Facebook, and blog buzz to drive eager buyers to your virtual doorstep. For free. David Meerman Scott is an award-winning online marketing strategist, entrepreneur, keynote speaker, and seminar leader. He is the bestselling author of The New Rules of Marketing and PR, also from Wiley. For more information, please visit www.davidmeermanscott.com.